Continuity mistake: In the first film, George refers to the tree that the family carved their names in as being in the front yard. In the second film, this same tree is referred to as being in the backyard. Suggested correction: It is also established he can be scatterbrained when under strain, and he is often under strain, and there's no reason they can't have two trees for that purpose. Continuity mistake: In the first movie, the wedding took place on January 6th. But in the opening sequence here the framed wedding invitation says October. Other mistake: In the scene where it's talking about the hottest summer the city's ever had (or something to that effect) some neighborhood kids are frying an egg on the sidewalk. The problem is, they're sitting and kneeling on that same sidewalk with their bare legs, and don't seem to be in any pain or discomfort. Trivia: Check out the Scrabble board after Annie moves back in. Words like "epidural, breech, and mother." All birth-related words. Talk about a theme game. 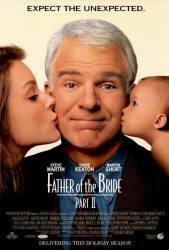 George Banks: Now, going to the movies, that'll be economical: one child, two seniors, thanks. Nina Banks: Just because we're older doesn't mean we're old. This is the 90s. Question: Is there any truth in the rumors that there is a subliminal message in the movie for American Express? Chosen answer: Well if there is it's too subliminal to notice - so no.